Juul and Altria, both makers of e-cigarettes and vape products, are in trouble with the U.S. Food and Drug Administration (FDA) again, this time for reneging on a promise the companies made to the government to help curb the epidemic of youth vaping. FDA Commissioner Scott Gottlieb said he is drafting letters to both companies that will criticize them for publicly vowing to remove flavored liquid nicotine pods from store shelves, while quietly working on a financial partnership that will, in fact, place even more nicotine pods on shelves. Top executives from Juul and Altria will eventually be confronted in person at FDA headquarters, where Gottlieb said they will have to explain to agency officials how they plan to keep their promise in light of the new agreement. On December 19, 2018, Altria, the nation’s largest traditional cigarette producer and the maker of Marlboro tobacco cigarettes, agreed to purchase a 35% stake in Juul, the rapidly-growing e-cigarette maker that has exploded in popularity among teens. 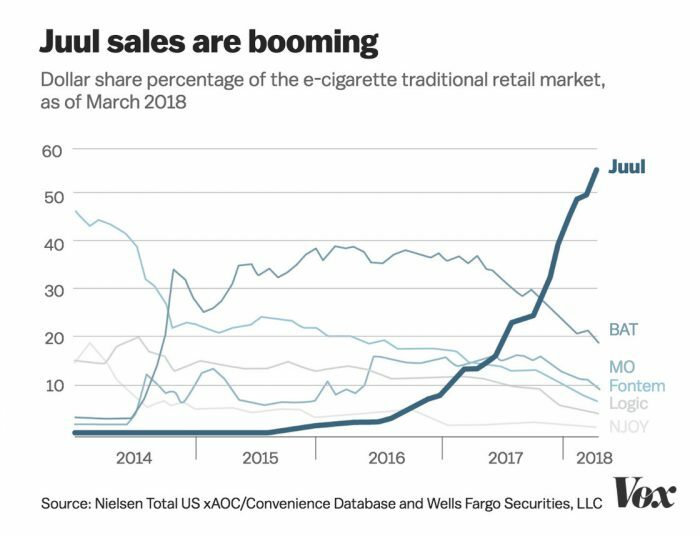 Juul currently dominates more than 70% of the e-cigarette market. The deal is worth about $13 billion. When e-cigarettes first hit the market, the products were touted as effective smoking-cessation tools. But vaping became highly attractive to teenagers and young adults in large part due to the flavored nicotine pods used in the devices. Juul, in particular, is a favorite among younger people. Vaping has helped many people quit smoking, but a number of studies in recent years show that vaping may be creating a new generation of nicotine addicts. In fact, research indicates that a large percentage of teenagers who start vaping eventually graduate to traditional – and more dangerous – tobacco cigarettes. Altria and Juul acknowledged this link and vowed to do their best to curb kids’ access to their products. Back in October, Altria agreed to stop selling pod-based e-cigarettes until the FDA gave the company permission to start up again, or until the youth problem was otherwise addressed. In a letter to the agency, Howard A. Willard III, Altria’s chief executive, agreed that pod-based vaping products significantly contribute to the rise in youth vaping. It also said at the time that it would support federal legislation to increase the legal age to purchase any tobacco or vaping product to 21. But the new deal between Juul and Altria will give Juul access to shelf space in 230,000 retail outlets where Marlboro cigarettes and other Altria tobacco products are sold. (Juul products are currently sold in 90,000 stores.) The FDA could ask Altria to restrict sales of flavored nicotine pods on its shelf space, but it is unlikely the company will comply with that request. In September, the FDA warned Altria, Juul and 3 other e-cigarette companies that they had 2 months to figure out how they would prove to the agency that they’d taken steps to prevent the sale of their products to young people. At the time, Gottlieb threatened that failure to do so would result in the companies’ products being pulled from store shelves and worse. Shortly after the announcement, Altria, Juul, and the other companies laid out to the FDA detailed plans for how they would comply with the agency’s requirements. But if there is one thing the tobacco industry has taught us, it’s that money is more important than human health.